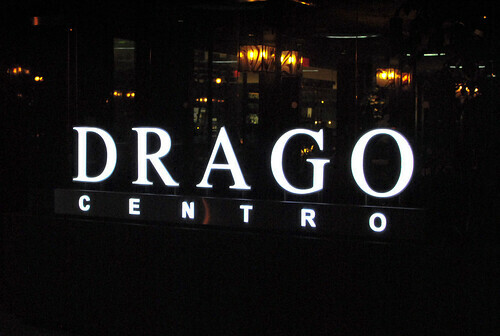 Drago Centro is a place I’ve visited many times. Of course, it doesn’t hurt that it’s across the street from where I work. Most of my recent visits have been for happy hour; the restaurant has one of my favorites in the area. It’s deceptively reasonably-priced and offers a strong list of discounted bar bites, wines and cocktails. 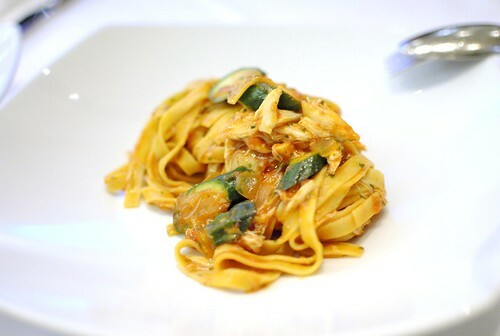 Still, I often find myself ordering one of the a la carte pastas which I consider some of the strongest in the city. I would get a chance to sample many of the pastas in this latest visit, revisiting some old favorites and enjoying some new ones. Cathy of gastronomyblog was invited to dine at the restaurant (her first time) and I eagerly came along. 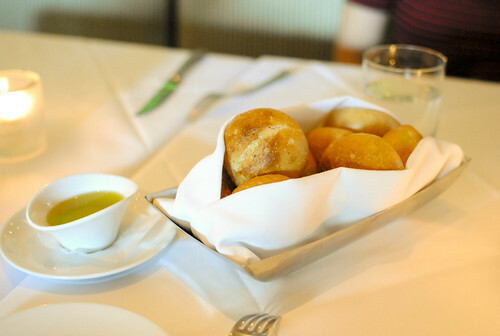 I enjoy the bread service, particularly with the bold and fruity olive oil that’s served alongside. We ordered a couple of small plates and focused in on a bunch of pastas. 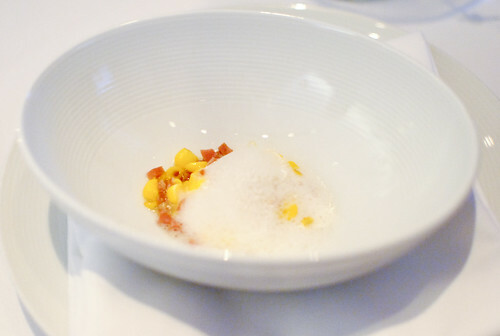 I really like when corn is in season and this soup was a clear reminder why. 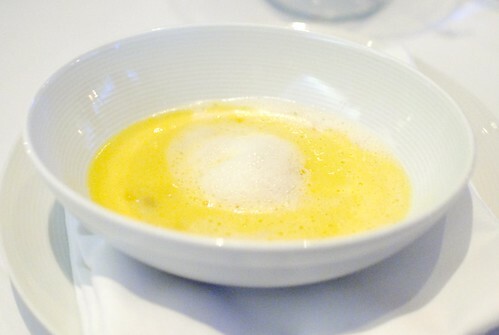 The soup was naturally very sweet with bright corn flavor. Rich but not heavy at all. The soppressata provided a bit of meaty flavor for an extra dimension. 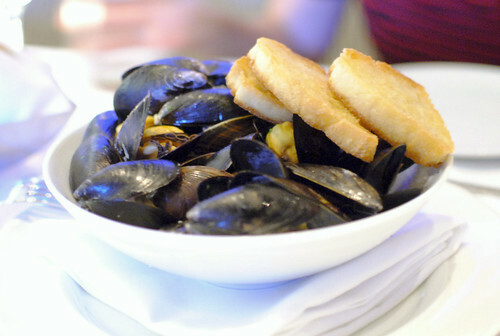 A heaping bowl of mussels came next. A simple dish with a white wine base, these were tasty but I feel like I’ve had these flavor profiles many times before with mussels. After a couple of appetizers we moved on to the main feature: pasta. As expected, the pasta came out perfectly al dente with a light tomato sauce. Sweet chunks of crab were the highlight for me, pairing well texturally and flavor-wise with the fettuccine and tomatoes. 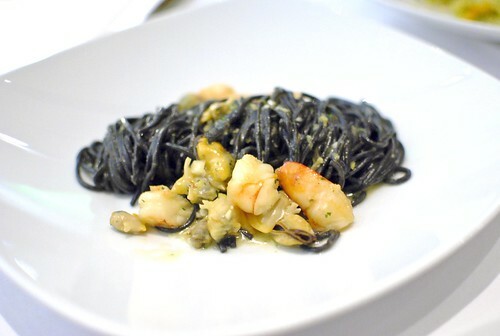 Next up was a squid ink pasta with a myriad of well-cooked seafood. I thought the lemon verbena added a bit of lemon scent that complemented both the seafood and squid ink well. 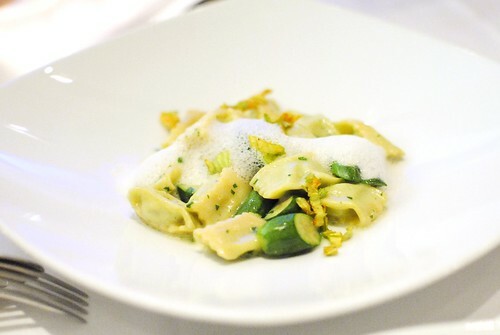 A simple dish but executed well, the agnolotti had a nice chew and a creamy filling. Small chunks of zucchini and a nutty brown butter sauce completed the dish. 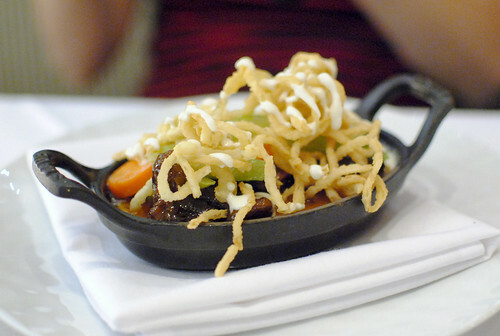 A signature dish here, I fell in love with it the first time I had it a couple years ago. 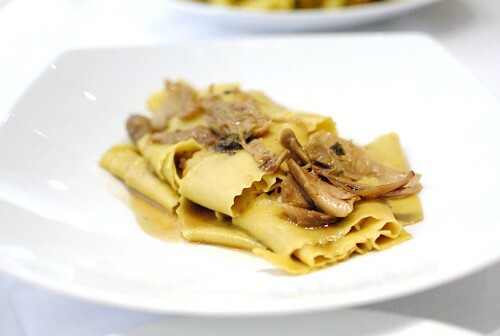 Ribbons of wide-cut pappardelle were smothered in a rich ragu with tender pheasant and morel mushrooms. Savory, hearty and delicious. This is another one of my go-to pastas. I really liked the texture of this type of pasta, having a really nice bite to it. Tasty sausage and fennel seeds were a strong tandem, while the parmesan added some creaminess to the buttery sauce. As our march of pastas ended, we transitioned to a rich mushroom risotto. 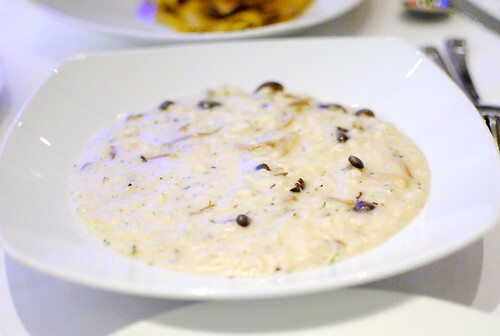 I think there was a lot of parmesan cheese since the dish was definitely rather thick and creamy; the risotto was a good one but not as exciting as our previous dishes. We were getting pretty full by this point, and this may have been the richest dish of the evening. A few pieces of tender braised oxtail were placed on top of a rather thick polenta; I thought this dish was pretty much as advertised. Crispy onion rings were a fun way to add some texture. When the dessert menu came, we were indecisive over two options..and the kitchen ended up giving us a little bit of both. 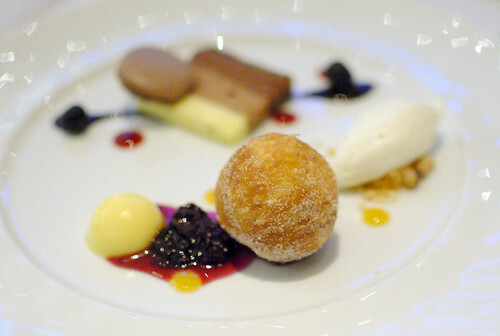 The doughnut was served warm with a light and airy center, dusted in sugar. I enjoyed the light whipped cream along with it. 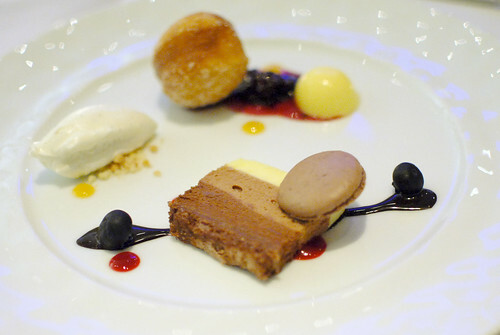 The dessert terrine was more complicated with layers of chocolate and olive oil. I thought the olive oil flavor was very subtle compared to the chocolate, though I liked tasting the individual layers of smooth mousse. A nutty chocolate base (similar to a kit-kat) provided the texture. Food-wise, this was another excellent meat at Drago Centro. Over the course of my visits, the service is what has been notably poor and that isn’t something that has gotten better. Still, the caliber of the food is some of the best downtown and the pastas hold their own compared to anywhere else in the city. For an expense-account option downtown (or just to splurge on some Italian grub) this place would have to be near the top of the list. Did you really think that the service was poor this evening? Other than the fact that I had food spilled on me, I thought our waiters were quite competent…maybe I’ve been eating in the SGV too often? I wasn’t necessarily commenting on this most recent visit – service was fine. But since my last post, there have still been a number of notably poor service nights. Two of my coworkers refuse to go back there for one visit in particular. To be fair, it was near the bar. To be fair(er), I got to agree that the le pappardelle al fagiano is delicious. Nonetheless, a bad experience is a bad experience.